Blazers are a compulsory part of the school uniform. 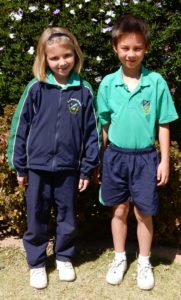 Parents and learners should note that on Physical Education days learners are permitted to wear EITHER the school tracksuit with the PT kit underneath, or the PT kit on its own. (No mixing and matching.) In each case, white socks and takkies are the prescribed footwear. Takkies should be lace-up type trainers that are white or majority white and blue. Slip-on type footwear is not suitable for activities undertaken in Physical Education.